But some say Marie Caro was one of the surnames of the dukes of Palma. The same veneration led him to imitate the virtues of his protectress by taking the vow of chastity, and although the eldest son of an illustrious house, he chose to follow the example of an uncle and four sisters, who had renounced the world and all its honours. He entered the society of the Theatins, and became distinguished by his austere piety and mortifications. 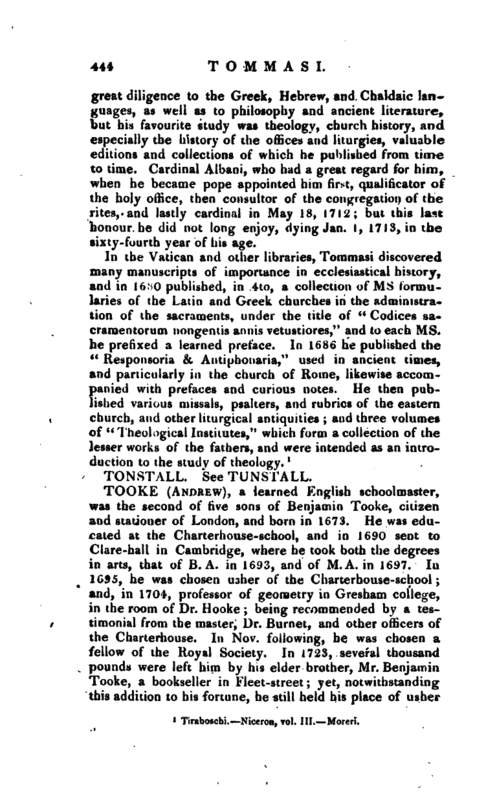 He did not neglect human learning however, but applied with | great diligence to the Greek, Hebrew, and Chaldaic languages, as well as to philosophy and ancient literature, but his favourite study was theology, church history, and especially the history of the offices and liturgies, valuable editions and collections of which he published from time to time. Cardinal Albani, who had a great regard for him, when he became pope appointed him first, qualificator of the holy office, then consultor of the congregation of the rites, and lastly cardinal in May 18, 1712; but this last honour he did not long enjoy, dying Jan. 1, 17 13, in the sixty-fourth year of his age. 1 Tiraboschi.—Niceron, vol. III. Moreti.